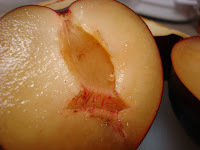 Ever since I was little, I have always liked stone fruits, particularly peaches and nectarines. There's nothing like biting into a juicy piece of fruit on a hot summer day. With juice running down your face and your mouth exploding with a sweet goodness, there's no better way to divulge in the warm weather of summer. And although I am a die hard stone fruit fan, there's one fruit in which I particularly never get a craving for. That lonely fruit would be the plum. Not that I have anything against the purple jewel toned fruit, I just never get an overwhelming urge to sink my teeth into the tart little plum. However, I have been seeing a lot of recipe that use the lonely plum. So this got me thinking...maybe plums are like Granny Smith Apples, you give them a little heat and they sweeten right up. And who doesn't love a baked Granny Smith apple? After searching through recipes, reading comments and finding out that plums were only $0.99 a lb., I had come to a decision. I was on a mission to make something that would finally allow me to add one more fruit to my list of favorite summer fruits! 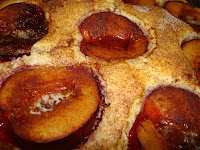 My accomplice in this mission was Martha's Open-Face Plum Cake. I cannot begin to tell you how simply satisfying this recipe was! 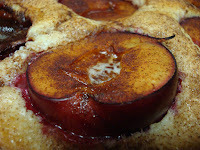 Not only was it the easiest recipe to make (ever), but I am now a plum believer! The plums really took on a sweet, juicy flavor. They also held their shape really well too, which was nice because it allowed me to get a good chuck of plum with each bite. I will never again say that I don't really care for plums! I see them in a whole different light now, and know that I have other ways to eat them that will ensure me being a plum fanatic from now on! 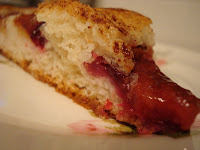 I came across your blog when doing a bit of "cupcake research" and immediately fell in love with the flavor and tone! Just wanted to point you toward a recipe demonstration Web video featuring fellow cupcake enthusiast and registered dietitian Jackie Newgent as she walks step by step through a delicious fruit cupcake recipe. The video was recently created by my client, the California Tree Fruit Agreement (CTFA), in order to share a healthful fruit twist on a longtime favorite. Here is the link to our video on YouTube (http://www.youtube.com/watch?v=ST1cY7Qcsqw), please feel free to embed the video directly into your blog. In light of your recent stone fruit posting, I thought this might be a great fit! You can also email me if you have any more questions. Thanks and happy cupcaking!